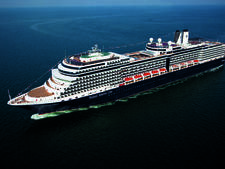 With its mid-sized capacity and classic styling, Holland America's stately Maasdam is a manageable and pleasant ship. After eighteen years in service, it has succeeded in retaining its youth -- with a major sweep of contemporary updates in both 2006 and the spring of 2011 -- but has resisted the impulse to act like a teenager. As such, the 1,258-passenger Maasdam has retained some of the traditional sensibilities that appeal to its older audience base -- high tea, formal nights, ballroom dancing and displays of antiques -- while adding elements to appeal to younger audiences. Such newer features include two contemporary alternative restaurants, wireless hotspots, three new hip specialty bars and an iPod tour of the aforementioned antiques. Indeed, there are some who say hats off to Maasdam for resisting some of the more radical trends of the behemoth ships (no surfing wave simulators or rock-climbing walls here), while stepping ahead on other fronts. Case in point is the ship's state-of-the-art, New York Times-branded Explorations Cafe, a combination library and digital fun room for the over 50 set (think touch-screen interactive maps, over-sized crossword puzzles). Its latest refurbishment, in April 2011, was part of HAL's $560 million Signature of Excellence initiative focused on modernizing its oldest ships. Along with new carpets, upholstery and soft goods, Maasdam gained three major features: a dinner-only Italian restaurant, two new kinds of cabins, and the Mix Lounge, a three-in-one bar central with each venue offering a specific type of drink and each flowing into the others. The new additions -- especially the alternative restaurant and bar area -- help up Maasdam's "hip factor" without detracting from any of the ship's classic charm. While Holland America is working to move beyond its reputation as a seniors' line, and Maasdam is one of the fleet's designated family friendly vessels, the average age on the cruise line's 15 vessels is about 57. Shorter itineraries and cruises during school holiday periods tend to attract a higher percentage of younger passengers and families. On Maasdam's non-summer and longer sailings, expect a more typical Holland America devotee -- a more senior crowd that appreciates the line's nod toward cruise traditions. Two nights in seven are designated as formal nights in the dining room. For the majority of men, this translates as dark suits (there are some tuxes), and for women, the range was from the little black dress to larger, longer, more colorful affairs. Dress codes apply to kids, too. On formal nights, the girls were adorable in their "fancy" dresses; most boys wore, if not suits, than at least shirts with ties. The rest of the evenings are "smart casual," that conundrum of a description that tends to create more questions than answers but in general means slacks or skirts for women and khakis and polo shirts or button-downs for men. Jeans, tank tops and pool attire are discouraged from public areas.